Today, we see deployment of vehicle telematics penetrating deeper into various segments like trucking, taxis, tankers, buses, RMC equipment etc. As products mature with more and more features getting added both from hardware and software side; we also unearth unique segment specific challenges. One such segment is the heavy machinery and infrastructure equipment monitoring segment. Often the machines are very expensive and consequently machine downtime comes with a heavy price tag. So powering an external telematics box device with wires to dashboard power is deemed risky by owners. Very often machines are deployed in remote locations where GSM coverage is of a very poor quality with frequent outages and low signal strength. Beside location what is very important for the operator is to know machine run time – Number of hours of operation of the machine, with exact start and stop log. It is a completely water proof (IP67), weather proof device that can be simply stuck to or bolted to the body of the equipment to be monitored. It has a built in sensor to detect engine vibrations in the machine/vehicle body to record engine ON and engine OFF times. This data is then updated periodically to the Sensel telematics servers that enable mobile/web app user monitoring. 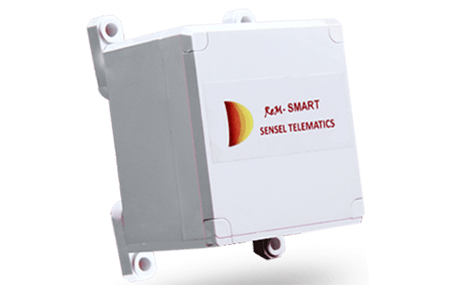 The device also captures location and transmits it to the telematics servers.The device comes with a long life internal battery with a life of up to 5 years. The actual update rate and GSM signal conditions in the field will decide the real observed battery life. Assuming the device updates data to the server once every two hours and average signal conditions, one can expect the battery pack to last for about 3 years before battery replacement. On each update the device also update the battery status. The device uses a combination of GSM data and control channel communication to optimize performance and power utilization. Copyright © 2007-2017 Sensel. All Rights Reserved.